I wish, really really wish I could be announcing our independence from cancer today but the sad sorry leadership in this country at every level doesn’t deem it necessary to make the number one killer of pets and people a national priority. With cancer research funding levels at a record low at the NIH, that makes what we do at The Puppy Up Foundation increasingly important. I’ll be brief because I have to go out and be Chef Big Dog today but what I love about this story is three things. First the folks in Madison WI that continue to raise the bar for our Puppy Up Walks. Second is that Dr. Christensen heard my presentation at the 2010 VCS conference in San Diego. Half the audience left since I was the last speaker at a long event so I want to give a shout out to him for that. And to Dr. Sue cause she stayed, too. Trail magic, my friends. Always. Third and most importantly is that this $100k study can potentially benefit all kids diagnosed with bone cancer – canine and human. Even though I was unable to attend the presentation of this rather large and seemingly uncashable check, there are a ton of people throughout the country who made our first grant of 2015 possible. So to all of those people, light up a sparkler or hell, man the roman candles – today is your day. I can’t celebrate the leaders of this country but I truly, completely celebrate you. From left: Beth Viney, PuppyUp Madison co-chair; Dr. Neil Christensen; Dr. Kai Shiu, PuppyUp Madison co-chair; and Ginger Morgan, Executive Director of the PuppyUp Foundation. We’re pleased to announce we have awarded our first grant of 2015 to the University of Wisconsin School of Veterinary Medicine (SVM). Our ability to continue funding such outstanding research is because of the passion and commitment of volunteers, donors, and sponsors all over the country, who organize and join in our PuppyUp Walks, participate in our yearly calendar contests, play in our golf tournaments (one is coming up in August), and contribute their time, energy, and resources to our common goal of eradicating cancer from the lives of those we love, whether two, three, or four-footed. Thank you for your continued participation and support. Osteosarcoma is a highly aggressive and painful bone cancer that affects both dogs and humans. With thousands of new cases diagnosed in dogs each year, it is the most common form of canine bone tumor, and most dogs succumb to the disease within a year of diagnosis. Oncologists at the University of Wisconsin School of Veterinary Medicine (SVM) have been investigating osteosarcoma for some time, looking to uncover its underlying causes and develop more effective therapies. And now, thanks to a $96,000 grant from the PuppyUp Foundation, the school will launch a new study aimed at improving mobility and quality of life for dogs afflicted by the disease. Under the direction of Dr. Neil Christensen, clinical instructor in the Department of Surgical Sciences and a member of the UW Veterinary Care (UWVC) radiation oncology team, researchers will explore the potential benefits of stereotactic radiation therapy for osteosarcoma patients. Specifically, the study will look at how stereotactic radiation performs in terms of pain relief for patients and in stimulating an immune response that helps patients’ bodies fight bone tumors on their own. UWVC is equipped to deliver this advanced treatment with its TomoTherapy unit, which was originally developed at the University of Wisconsin-Madison using data from SVM clinical trials. TomoTherapy is now used widely in human medicine, but only one other veterinary medical hospital in the nation offers this technology. 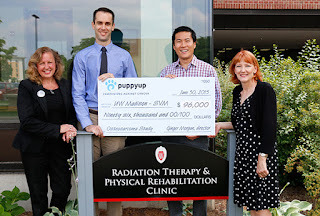 The Puppy Up grant stems from proceeds from the PuppyUp Madison Walk, which helped raise more than $213,000 in 2014 and 2015. The PuppyUp Foundation aims to discover the links between canine and human cancers, as well as the causes of these diseases, by supporting comparative oncology research and promoting awareness of the field. Christensen’s collaborators on the study include Dr. Timothy Stein, assistant professor of medical oncology; Dr. Michelle Turek, assistant professor of radiation oncology; Dr. Lisa Forrest, professor of radiology and radiation oncology; Margaret Henzler, medical physicist; Dr. Jason Bleedorn, clinical assistant professor of orthopedic surgery; Dr. Peter Muir, professor of orthopedic surgery; and John Kloke, assistant scientist in the UW-Madison Department of Biostatistics and Medical Informatics. I’ve got one more night in this hotel until we start the next leg of the journey to 20 and up into the mountains and my thoughts return to High Street. I almost got hit by oncoming traffic like a half dozen times and I do not exaggerate here. I took this photo of a warning sign about falling rocks and I was like, screw that, beware of the rocks in the heads of the drivers coming down this mountain. There was one driver who came around a hairpin curve texting and she came within inches of hitting me. And I swore to the top of my lungs at her. And then came the voice from up high. Shaking, almost pasted against a rock wall in hesitation to continue up this mountain, I looked up and there was this old guy calling out to us. ‘I saw you on TV’, he said. ‘I was worried about the dogs’. ‘You and me both’ I thought to myself unsure how to respond or what to say to this godlike figure although his Lebowski-esque attire didn’t fit the whole supreme being image in my head. ‘Is it always this bad on this road?’ I inquired hoping for a hail mary. ‘You should’ve taken 7th Street’, he answered. I’m a poker player and there’s always a 4th and 5th street bet that you called or should have laid it down but when you’re in a hand, you’re down in it. And that’s where we were. Ginger Morgan, the Director of our foundation, taught me that lesson. There is no ‘should’ in life. And I thought about that after almost getting killed on High Street. I thought alot about why. Why put myself and moreover and more importantly the lives of my boys at risk? The old man asked me. ‘No I don’t’, I replied. And I lead my boys up to the top of the mountain unscathed and untouched. 9 COSAS QUE UN CIUDADANO MADRILEÑO DEBE CONOCER ACERCA DE LAS PROTESTAS EN CONTRA DE LA PRIVATIZACIÓN DE LA GESTIÓN SANITARIA EN LA COMUNIDAD DE MADRID. HOY HE APRENDIDO UNA NUEVA PALABRA EN EL COLEGIO: FARIÑAZO.